A veteran novelist and best-selling author, James Byron Huggins’ life story reads more like fiction than fact. His career as a writer began normally enough. He received a bachelor’s degree in journalism and English from Troy State University, and then worked as a reporter for the Hartselle Enquirer in Hartselle, Alabama. Huggins won seven awards while with the newspaper before leaving journalism in 1985. With a desire to help persecuted Christians in eastern Europe, Huggins moved to Texas to work in conjunction with members of the Christian underground in that region. From the Texas base, Huggins helped set up a system used to smuggle information in and out of Iron Curtain countries. In 1987, Huggins was finally able to leave the United States to offer hands-on assistance in Romania. As a jack of all trades, Huggins photographed a secret police installation, took photos of people active in the Christian underground, and also continued his work as an orchestrator of smuggling routes. Huggins was instrumental in smuggling out film and documentation that showed the plight of Christians in Romania. He even found time to create a code that allowed communication with the United States. As in Texas, Huggins’ life had few creature comforts. To survive, he would often remain hidden in the woods or in secure basements for days at a time. After his time in Romania, Huggins returned to the United States and took up journalism once more. He again worked for a small newspaper and won several awards as a reporter. Later on, he worked at a nonprofit Christian magazine before becoming a patrolman with the Huntsville Police Department in Huntsville, Alabama. After distinguished service as a decorated field officer, Huggins left the force to pursue writing novels. His first three novels–A Wolf Story, The Reckoning, and Leviathan–achieved best-seller status in the Christian marketplace. From there, Huggins broke into mainstream science fiction with Cain and Hunter, both of which were optioned for film rights. Huggins then released Rora, a historical novel depicting the harrowing life of a European martyr. His following book, Nightbringer, was met with critical acclaim and is in production for a movie. Find out more about James Byron Huggins here. 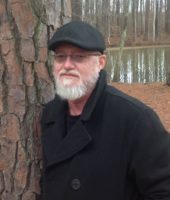 Discover books by James Byron Huggins.